View on GitHub Fork me on GitHub! Installing i18n-lint globally via npm gives you the i18n-lint binary. --exclude <exclusion patterns>          Comma-separated list of glob patterns to ignore,  e.g. "/test_subdir/,ignored.html"
i18n-lint can be used in other projects as a library. After installing, simply require the module. i18n-lint is also available as a grunt plugin: grunt-i18nlint. 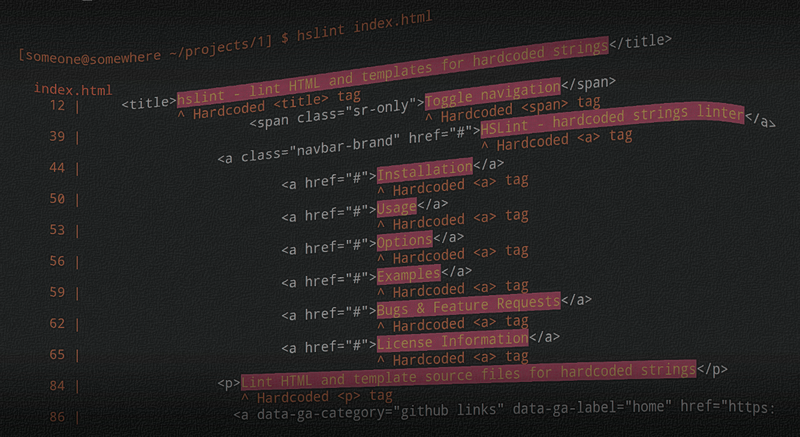 After installing, you should be able to type i18n-lint into a terminal. After installing, you can require the i18n-lint lint module in your code. "scope": "  <a href=\"#\" alt=\"hardcoded alt\"><%= translation %></a>"
Choose which report to output the results with. Defaults to 'default'. JSHint reporters can also be used. Please post a new issue on the project issue tracker.